Badrinath Temple is one of the holiest Hindu temples in India. It is situated in Uttarakhand state along the river Alaknanda, the holy place is fundamentally a Lord Vishnu temple. Badrinath also known as Badri Vishal and Badrinarayan. The major appeal of Badrinath Dham is the one gauge tall bronze of Vishnu in the shape of Lord Badrinarayan which is cast in black "Shaligram" granite. Shri Badrinath temple is flank by two mount ranges recognized as Nar and Narayan with the very tall Neelkanth peak offering a fine background. 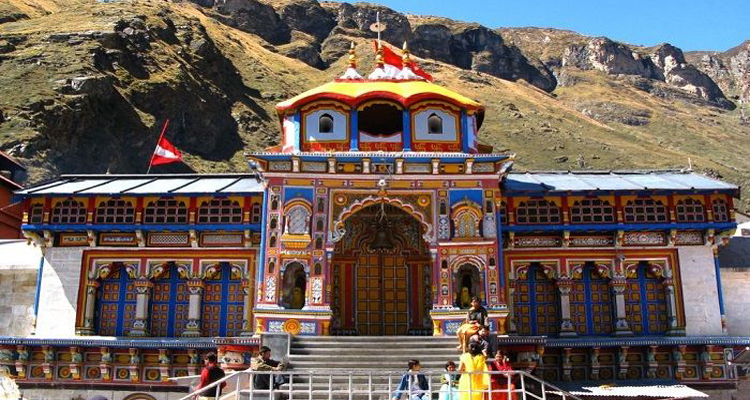 Uttarakhand Chardham presents you a spiritual religious Badrinath Yatra Tour. We pleased to serve you our Badrinath Tour services with well vehicles good accommodation and knowledgeable driver. Every year many people go to Badrinath Dham for Darshan. Temple gates open only for a period of six months, due to intense weather conditions in Himalayas. There are a number of hot water pools here that is Tapt Kund, Narad Kund etc. Uttarakhand Chardham presents you Badrinath yatra from Haridwar to Haridwar with in four days. The opening dates of Badrinath are announced on Vasant Panchami in 2019. Badrinath is nearby by road and vehicles go up to the main city. We also organize Badrinath yatra by helicopter. It is a day trip and the Tour will end on the same day by afternoon. Uttarakhand Chardham also arrange you special Aarti at Badrinath Temple So pick you phone and call Uttarakhand Chardham we 24 hour ready to serve you our Badrinath yatra service. We will make your Tour memorable. We welcome you at Haridwar Railway Station, Hotel in Haridwar, Jollygrant Airport or anywhere else. And from here we start our Badrinath Yatra. In the way we Saw the Rishikesh, Devprayag, Rudraprayag, Karnprayag and reached Joshimath in the evening. Check in the hotel in Joshimath and overnight stay in the hotel. In the morning we take our breakfast and start our Badrinath Yatra and reached Badrinath in afternoon. Visit to the holy Temple Sri Badrinath Ji and expend time visiting Mana village the last village previous to the Tibetan border, Byas Gufa, Bheem Pul, Saraswati River. After this check in the hotel in Badrinath and Night stay in the Badrinath Hotel. In the morning we take our breakfast and start our third day of Badrinath Yatra from Badrinath to Rudraprayag. In the evening we reached Rudraprayag and visit holy temple in Rudraprayag and check in the hotel in Rudraprayag and overnight stay in the hotel in Rudraprayag. In the morning we take our breakfast and start our last day yatra from Rudraprayag to Haridwar. On the way we reached Rishikesh and visit Ram Jhula, Laxman Jhula, Triveni Ghat, Swarg Ashram here. And after this we drop you at Haridwar Railway Station, Airport or anywhere else.